I hold a special place in my heart for chocolate. Very special. And never has chocolate been more special to me than since I became a mother. Imagine my sadness when my little Kaitlyn (now 7) was born with reflux. Caffeine can really aggravate reflux, even amounts as small as chocolate, and it really caused problems for Kaitlyn if I ate it. As special as chocolate is in my heart, my kids are even more special. I survived that year of nursing without eating chocolate. When Brinley (now 2) was born, they had the most delicious chocolate pie at the hospital. Seriously amazing. I soon noticed Brinley starting to have fussy times similar to what I remembered with Kaitlyn’s chocolate aversion. I cut chocolate and she was fine. I added some back in and we had fussy times. So I once again went a year without chocolate (sidebar, interesting thing here is after Brinley, I didn’t like chocolate so much. I actually don’t like milk chocolate at all anymore. I do, however, like dark chocolate). I recently posted tips on Surviving Witching Hour. 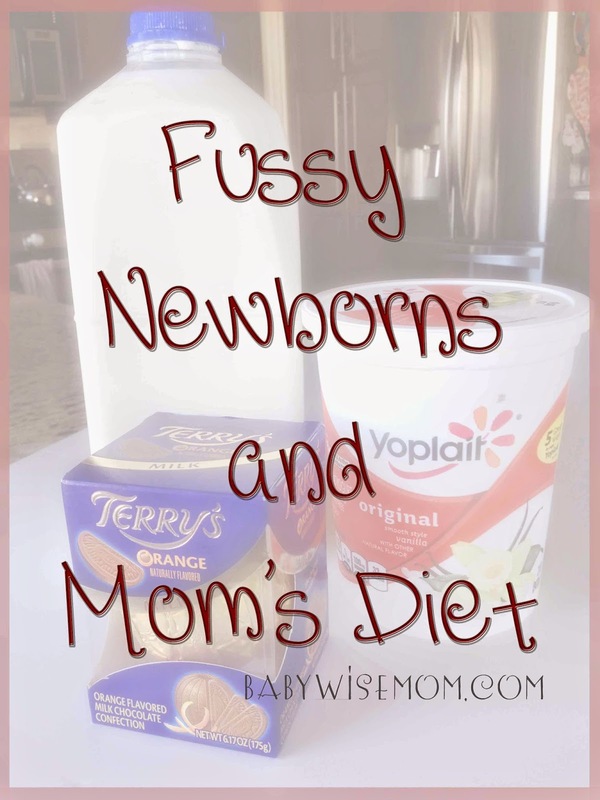 One reader commented and said to consider mom’s diet if you have a fussy baby. She said she cut chocolate and her baby stopped having witching hour. She said she got the idea from one of the posts on this blog. It was such a great point from this reader I decided it needs its own post. If your baby is fussy, consider your diet. There are a variety of foods that can cause a baby to be fussy. Some might cause your baby to have more gas, which can lead to fussiness. Some can cause your baby to spit up more, which can lead to fussiness. Some might even be foods your baby is intolerant of or allergic to. If you think your baby is more fussy within about 4-12 hours after you eat a certain food, you can try to eliminate it from your diet. It can take a while for the food to completely leave your system (1-2 weeks), but you should see improvement within a few days. For Brinley and chocolate, her most adverse reactions were within 3-12 hours. Then she was okay. Diet is definitely worth looking into if you have a fussy baby. I know it is hard–I went two years without chocolate! And I know I am not alone. I know many mothers go without a variety of foods because they cause problems in their baby. You can survive! I promise you can do it. And really, if you can’t survive cutting the foods your baby needs cut, consider formula feeding. I know that isn’t a popular recommendation with all people, but you have to do what is best for the whole family as a big picture. I have a friend who is a rock star who breastfed a year without eating dairy. I am not sure I could manage that (I once went two weeks when breastfeeding Kaitlyn and realized how much dairy I eat!). Food is a wise thing to consider if you have a fussy baby on your hands. Next Post Is Modesty Worth Discussing? That is good to know that babies can outgrow it that young! And way to go without dairy so long! Great post!! And so true. My little one ended up with a dairy allergy, so I had to give up dairy while nursing. It was hard, but so worth it. And I never knew that such things could cause such big problems until I was in it myself. Sarah like I said, I am so impressed with people who go without dairy! I remember trying to eat breakfast–everything had dairy in it! I didn't know about all of the milk alternatives then. I gave up chocolate and coffee,even decaf, black tea, soda, and green tea because they are acidic or have theobromine in them. I've been using nat phos 6x homeopathic remedy. It has helped my daughter's reflux so much.